Lg Optimus L4 II Dual is now available online from retailers . Lg Optimus L4 II Dual is single core device . At the same price you can buy Karbonn A27+ smartphone , which is a Dual core smartphone . Lg Optimus L4 II Dual is powred by Mediatek MT6575 single core processor which is cloacked at 1GHZ frequency . It has 3MP rear camera with LED flash . It is Dual Sim handset with Dual Standby . There is dedicated button SIM switching . It has 3.8inches capacitive touch screen of 320×480 pixels resolution . The Optimus L4 II Dual E445 is running on Android 4.1jelly bean OS . the device hoses a1700mAh battery . The LG L4 II Dual has 4GB ROM ( internal memory ) & 512mb RAM . Further the memory of the device can be expandable up to 32GB via SD card . It does support 3G , 2G , WIFI , Bluetooth 3.0 , aGPS , 3.5mm audio jack & micro USB . Micromax A54 Ninja 3.5 ( Unboxing & review ) is Another competitor to this device . 1GHZ MT6575 single core CPU . 512mb RAM & 4GB on board storage . 3MP camera with LED flash light . 3G , 2G , WIFI , Bluetooth 3.0 , aGPS , 3.5mm audio jack & micro USB . 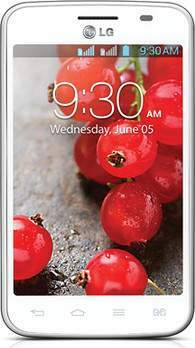 LG Optimus L4 II Dual E445 price is RS 8990 via flipkart .